Today the world learned that Aurora, Colorado shooting suspect James Holmes was formally charged with 24 counts of first-degree murder and 116 counts of attempted murder (Huffington Post, 2012). We learned of this after he was charged. The court hearing occurred behind closed doors. As I watched the details unfold through the national news I found myself pondering the million dollar question. Why did this horrific event happen in the first place? And are we as a society really going to continue hiding from the world of mental illness? Are we shielding or protecting ourselves and our loved ones from mental illness? We can’t afford to continue to hide from the fact that 450 million people suffer from a mental illness around the world (WHO, 2010). I’m on the fence today about whether or not it was the right thing to do to shield Holmes from the public. I say this with the highest respect for the victims and their families. However, the “closed doors” symbolize for me the continuation of not talking about mental illness. Is it not okay for the public to “see” mental illness? 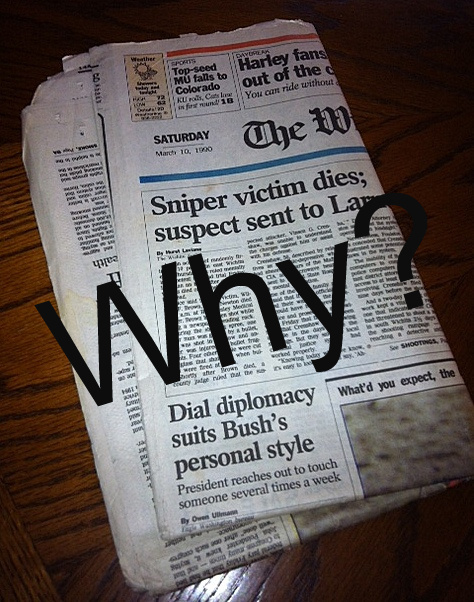 Are we protecting James Holmes? I think that in order to stop horrific events like the Aurora theater shooting from happening we must talk about it. We must see it. We must learn from it. It is time we get educated about mental illness including prevention and treatment. We have to do something different because whatever we are doing now is clearly and sadly not working. I know this at the most intimate level because my husband was a victim of the 1990 Wichita shooting spree that ultimately led to the death of one person. The Wichita gunman had a bomb in his car that was later detonated. Bill miraculously survived after being grazed by a bullet and being car chased by the gunman. To learn more about the Wichita shooting spree you can click here: http://www.apnewsarchive.com/1990/Police-Seeking-Motive-in-Shooting-Spree-One-Victim-Dies/id-5718bdbba98c5dad0adf2de077a29152. I pray that we can come together to find a solution. It’s time.